Tracy Porter, nationally known lifestyle, home and fashion designer, operates her multi-faceted design business from the rural college-town of Ripon, Wisconsin. Women from New York to Los Angeles seek out Tracy for a taste of her fashionably eclectic goods, savvy tips and inspiring style advice. 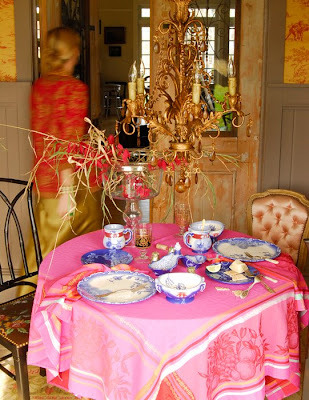 In 1991 Tracy started her hand painted luxury furniture line created from her farm’s vintage chicken coop. These humble beginnings left retailers on an exclusive waiting list for her one-of-a-kind treasures. 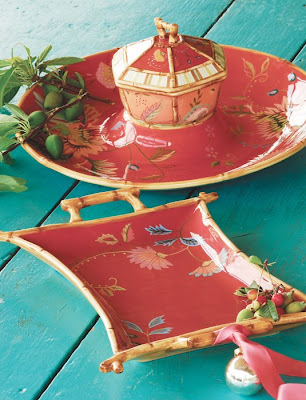 Tracy Porter is renowned for her fanciful dinnerware collections (favored by Neiman Marcus, Horchow, Bloomingdales and Target) and inspired designs for the home (bedding, furniture, lighting, décor). Tracy has launched an ever-inspiring lifestyle blog. She delights in chatting with readers and produces a daily lifestyle on demand video series offering a peek behind the scenes into Tracy Porters design studio as well as cooking, gardening and fashion tips. Tracy, her husbandbusiness partner, John, and their four young boys. Tracy resides on a country gentleman’s farm in Ripon, Wisconsin. We have four boys under age 8, lots of power ranger toys (though I don’t collect those) and pez dispensers (I do collect those). We have a donkey (an anniversary gift 10 years ago to each other), a goat, many ducks and 2 gargantuan Newfoundland dogs. We love to eat, cook and cocktail.We are very passionate about food and all things related. I love writing, gardening, swimming in our pond and hanging with our family. I could read all day and may not ever have enough books or bookcases. I collect nearly everything...I am a distracted collector always onto the next. Sugar is my biggest downfall, namely cheap candy bars or fancy pastries.